When it comes to adding a retro feel to modern things, artists often derive their inspiration from the Steampunk era. Accordingly, they come up with Victorian-themed gizmos, apparels and accessories to amaze Steampunk lovers. 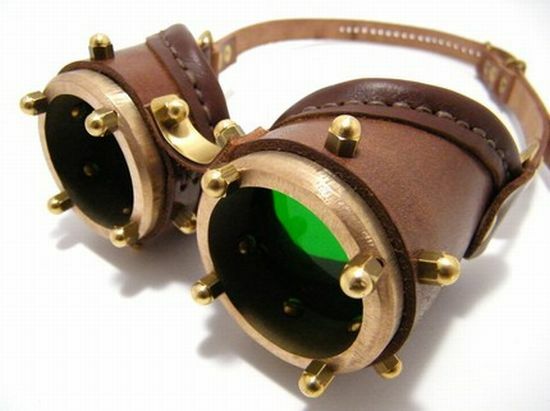 Steampunk goggles, with a fair bit of ingenuity involved, definitely take that retro craving to its next level. The one-of-a-kind goggles are made of solid brass. 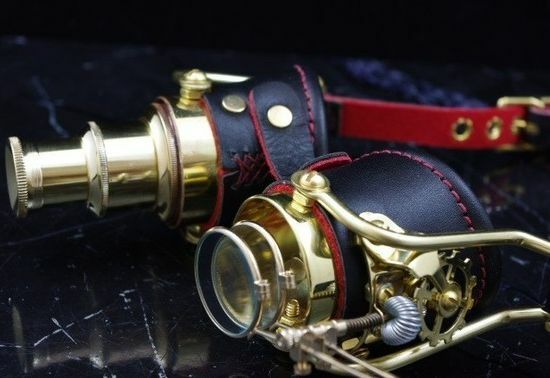 Draped in genuine leather, these goggles add a sure element of art to your collection of steampunk stuff. Featuring a show-stopping telescope, the Steampunk goggles go beyond being mere eyewear. The goggles include perfectly hand-assembled, hand-polished and hand-engraved parts, except for steel-lined lenses and leather eye cups. Available in different colors, these hand-sewn goggles flaunt screen covering over the glass. Created by folks at Double A Stitching, these goggles come in different styles. A hard plastic body neatly surrounds thinner leather straps, further reinforced with metallic attachments. 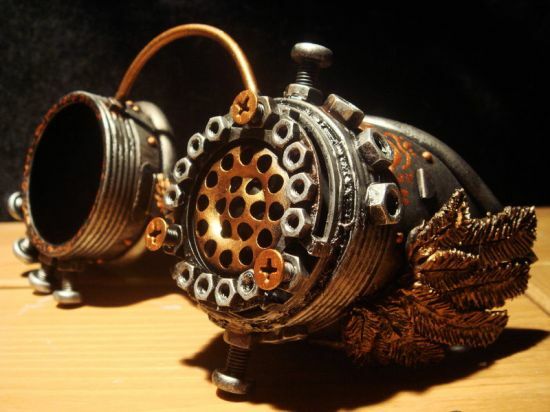 Russian artist Santi has created the Steampunk goggles out of various metals, shapes and textures. The goggles include accurately placed bolts and perforated metal attachments for providing Steampunk fans with an exhilarating experience. The above-pictured goggles make a perfect Steampunk / Cyber Goth / Sleepy Hollow / Mad Scientist Gear. Made from a durable and flexible plastic base and hand painted throughout, the goggles flaunt a fully adjustable, customized five-lens system. Its fully adjustable vinyl strap has real brass bolts for added durability. Each side of the goggles feature a large flip down magnifier and a fully opposable arm with two smaller flip down brass lenses. These handmade goggles touts precisely cut frames and thick olive green transparent Perspex lenses to ensure clear vision and clients’ safety. 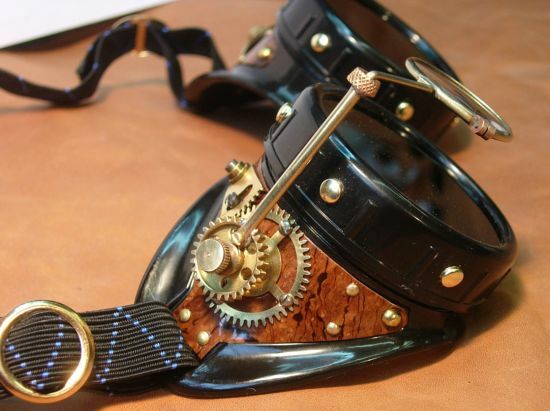 Created by Mann & Koryaki , the Steampunk goggles make sumptuous use of rich brown leather and come finished with bee-wax. 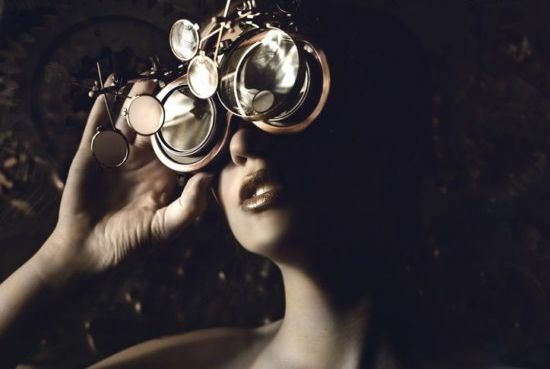 Avid Steampunk fans would like the goggles that, undeniably, seek to revive that forlorn Victorian charm. Flaunting tightfisted use of leather and brass, the vintage-looking goggles seem to have come straight out of sci-fi fictional world. 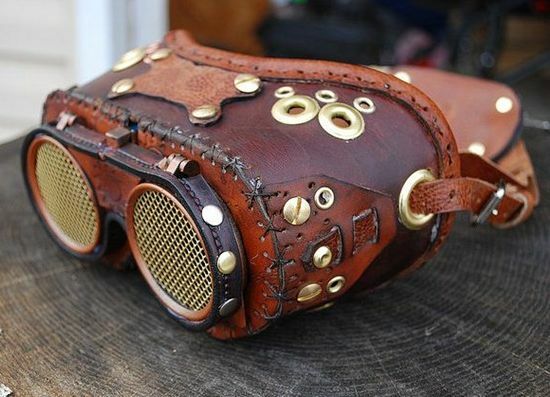 These binocular styled steampunk goggles speak volumes about the artist’s craftsmanship. 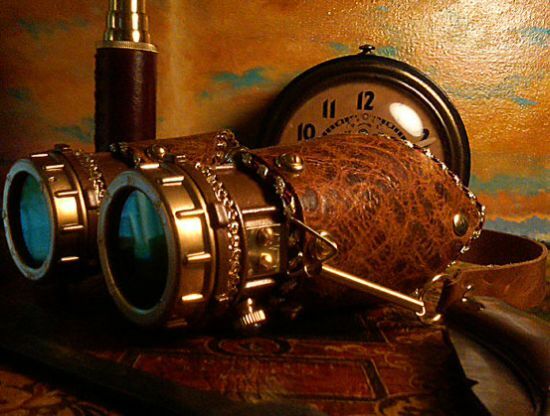 Aside from having a metal eyepiece, green (or blue or red) hard plastic lens, unique leather eye cuffs and brass or chrome fittings, the unique steampunk accessory features brass or silver color springs and leather head piece as well.